Bay sister, here... I just got married in Calistoga (hooray! Recap to come when we get the photos back...) so my new husband and I headed off to Kauai for a quick honeymoon last week! Hawaiian Airlines now has a hub in Oakland, so flying from the Bay Area to any of the major Hawaiian islands is super easy and affordable. While the trip is fresh on my mind, I thought I would write up a little travel guide with our honeymoon highlights -- so here is a 6 day itinerary based on our experiences. You will arrive at Lihue Airport and immediately pick up your rental car. We used Kauai Rent a Car, which was affordable and so easy to deal with. They text you the location of your car in the airport parking lot and leave the keys for you in the glove compartment, so there's no waiting at rental car check-in counters. You'll spend the first 3 nights on the northern side of the island, so first head north to Kapaa for a quick lunch. Chicken in a Barrel has amazing barbecue chicken, which you can enjoy right there on the beach. Next, drive to your first apartment in Princeville. We stayed at the Hanalei Bay Resort, which I highly recommend! It is right next to the very fancy St. Regis, with the same beach on Hanalei Bay and the same great views, and has a 'lagoon style' pool and hot tub. They also provide golf cart rides directly from your room to the beach! After checking in, drive west to Tunnels Beach for some snorkeling. It gets its name from the underwater caverns in the reef formed by lava tubes. It also happens to be where Bethany Hamilton lost her arm to a shark, so swim at your own risk! After snorkeling you should enjoy the hot tub at the resort, watch the sunset from the lawn, and then go out to dinner at the Tahiti Nui. It can be pretty touristy, but they have delicious 'world-famous' Mai Thais and great live music. Sunset from Hanalei Bay Resort. The small peak seen through the trees on the left is Makana, or Bali Hai, made famous by South Pacific. On your second day, you will hike along the Na Pali Coast. To hike all the way into the Kalalau Valley, you need to reserve a permit *way* ahead of time here. We weren't so forward thinking, so we we had to 'settle' for hiking in 2 miles to the first beach in Hanakapi'ai Valley and another two miles into the waterfall there, for a total of 8 miles round-trip. The hike was incredibly gorgeous, but also challenging, with lots of rocky, steep, and muddy terrain. Definitely bring plenty of water and snacks and shoes you don't mind getting muddy for this one. You'll love seeing the crystal clear turquoise water from high up on the cliffs, and swimming at the base of Hanakapi'ai falls. Looking down the Na Pali Coast. After the hike you'll most likely be starving, so head back along the road to Sushi Girl for some lunch. The sushi burrito and the poke bowl are to-die-for. It's just a small takeout window, so you have to get your food to go - we recommend eating at nearby Ha'ena Beach. You will then spend the afternoon at Limahuli Garden and Preserve, which is part of the National Tropical Botanical Garden. The setting is lovely, and the self-guided tour was incredibly informative - not only about plants but about the history of Hawaii. The islands were originally settled in AD 200 by the Polynesians who they came in voyaging canoes with 27 kinds of plants (including the coconut- it's non-native!) and 4 kinds of animals. The island changed radically again after 1778, during the plantation years, when most plants now associated with Hawaii were introduced such as pineapple and plumeria. There are benches and water-stops along the way where you can enjoy the views and read about Hawaiian mythology and legends. After watching another beautiful sunset from the resort, try dinner at The Dolphin, where they have amazing sushi rolls and sashimi. Today will be very exciting, since you'll wake up early to drive to Lihue for a doorless helicopter tour! Stop for breakfast in Kapaa at Art Cafe Hemingway, which has a super cute European vibe and delicious egg dishes. After that you'll arrive at Jack Harter Helicopters, for a quick safety briefing before heading out on your tour. This was one of the highlights of our trip! The pilot was informative, the views were unbeatable, and although we were nervous about the rain at first, it made for some beautiful rainbows. You'll get to see Waimea Canyon (aka the 'Grand Canyon of the Pacific'), the waterfall from Jurassic Park, the Na Pali Coast, and the ancient volcano of Kauai, Mt. Waialeale, which gets the most rainfall per year of any spot on Earth. Fun times in the helicopter! On the way back to Princeville from Lihue, stop in Kapaa again for a juice and a kombucha from Kauai Juice Co. We were so hooked on the juice and kombucha that we went back at least once a day for the rest of the trip. There are 3 locations- Kapaa, Kilauea, and the recently opened shop in Poipu, so no matter where you are on the island you can get your juice fix. Keep the bottles because kombucha refills are a dollar cheaper and returning a bottle will get you a 50 cent deposit back. The husband at Kauai Juice Co with a 'Beetlejuice' and a pineapple/dragonfruit kombucha. In the afternoon visit Queen's Bath, a tidepool in Princeville perfect for swimming and jumping into. 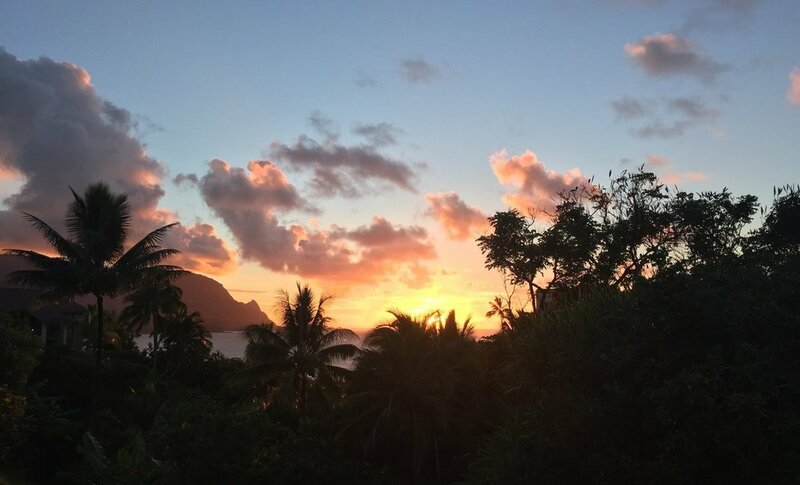 It's an easy walk from Hanalei Bay Resort, but if you are staying farther away you'll want to drive there. Be warned- the hike down is incredibly muddy and slippery- don't wear your white 'bridal' swimsuit for this activity like I did. For dinner, go to Bar Acuda a tapas restaurant recommended by goop. We loved the salad paesana, the 'whole tomato' bruschetta, the banderillas, and the roasted ono. Reservations are required, so make sure to call and make one before you leave for your trip. Halfway through the trip, you'll change locations to the south coast and stay in the Koloa / Poipu area for the remainder of your time on Kauai. We stayed in an Airbnb, but if the resort scene is more your style, I would recommend the Grand Hyatt. We spent a lot of time at Shipwreck's Beach, directly in front of the Hyatt, and it looked very nice (even nicer from the outside than the St. Regis we thought). The Hyatt also apparently has the best spa on the island, and now I'm wishing we had sprung for a couple's massage. On the drive down, stop in Kapaa for another kombucha and brunch at Java Kai. We really wanted to try taro (a traditional Hawaiian food staple) on the trip so we got the BBQ Taro Burger, and it was pretty delicious! After checking into your hotel or Airbnb, you can do what we did and pick up a bottle of rosé and spend the rest of the afternoon at Shipwreck's Beach, sipping wine and watching the surfers and body-surfers. If you prefer a more active afternoon, try renting a surfboard here or here and getting out there yourself, or go snorkeling at nearby Lawai Beach. My favorite magazine and some rosé on the beach. Dinner tonight is super low key - eat at Island Taco, more of a fast food joint, but with killer wasabi seared ahi tuna tacos made in fresh flour tortillas- yum. Today you'll go on another epic hike- the Alakai Swamp hike. After grabbing a quick breakfast in town, I recommend the Hulk smoothie bowl at Anake's Juice Bar, drive to the Pihea Trailhead in Koke'e State Park. The drive is about an hour and half, but allow some extra time to stop at the Waimea Canyon lookouts along the way. If you'd like a trail map you can pick one up at the Koke'e museum. The trail starts out with an overlook of the Kalalau Valley, and continues along the rim of the valley for about a mile before descending towards the Alakai Swamp. As with the other hike, this trail is extremely muddy, rocky, and slippery in places, so be sure to wear shoes with sturdy soles and watch your step. Once you reach the Alakai Swamp Trail, however, much of the rest of the hike is on boardwalks, so the walking gets a bit easier. After hiking through the highest swamp in the world, which was cloudy, rainy, and eerie when we went, you will reach the Kilohana Overlook. On clear days, this will give you gorgeous views of Hanalei Bay. On days like the one we had, you will be looking directly into a cloud... But even with cloudy weather, the hike was worth it. At roughly 8 miles roundtrip, make sure you bring snacks and plenty of water. Hiking along the rim of the Kalalau Valley. Boardwalk through the Alakai Swamp. Better views of the Kalalau Valley at the end of the hike once the clouds cleared. After driving back to town, grab a late lunch from Makai Sushi, which is tucked inside an unassuming market along with Anake's Juice Bar. We took our 'Gorilla' poke bowls to-go, and enjoyed them on the beach along with another kombucha. We had another lazy afternoon/evening on this day, but if you previously enjoyed the Limahuli Garden and Preserve, you may enjoy seeing the other locations of the National Tropical Botanical Garden, the McBryde and Allerton Gardens. McBryde is the NTBG's flagship garden, a global repository of rare and endangered tropical plants, and one I wish we had checked out. For dinner, we got tacos from TR Cantina and Margarita Bar. The tacos were pretty good, and the drinks were decent, but if I could choose again, I would have tried the restaurant next door, Merriman's Fish House, which was recommended to us by a local as a nice 'date spot.' Another option would be Pizzetta, another goop recommendation. This is your last full day on Kauai, so you should pack it as full of adventures as you can. After another smoothie bowl (now I wish we had registered for a Vitamix), drive to Lihue for a tubing adventure with Kauai Backcountry Adventures. Kauai used to have thousands of acres of sugarcane plantations, and this tubing adventure takes you through the irrigation ditches used to carry water to the fields. It goes through five tunnels cut through the mountain sides, which we found exhilarating, but wouldn't be good for anyone with claustrophobia. The tour provides a helmet, headlamp, gloves, and lunch after you finish tubing. The tours fill up so you'll need to reserve this ahead of time. For the second half of your day, head down to Port Allen to take a sunset cruise of the Na Pali Coast. We went on a Holo Holo tour, but some other friends recommended Captain Andy's. Book this tour ahead of time as well. Although you have already seen the coast from two viewpoints, by foot and by helicopter, it's also worth seeing by boat. The views are incredible, the beer is unlimited, the food is delicious, and there is a champagne toast at sunset. It's an amazing way to spend your last night on Kauai. The beach at Kalalau Valley. On your last partial day on Kauai, get one final smoothie bowl and one final kombucha before you head to the airport. If you have 20 extra minutes, take a small side-trip to Wailua Falls for one last vista before you leave. Legend has it that the next Hawaiian chief was chosen by jumping off these 100 foot falls, but you can just enjoy the view from the top. This brings your 6 day Kauai adventure to a close - Mahalo!